Take a romantic cruise and bask in the cradle of the shimmering Khor Dubai or the Dubai Creek on a traditional dhow for an evening full of breathtakingly beautiful views and outstanding cuisines. A wooden vessel gliding across the water -- a traditional dhow cruise – might be one of the best ways to explore the Creek waters while having a sumptuous romantic meal. The dhow or the traditional Gulf sailing ship made from teakwood is an essential part of the UAE’s rich maritime heritage. Historically, dhows were used for trading, fishing and even pearling. Plying their way along the Gulf, the dhows used to sail between the Middle East, India and East Africa, trading dates, fish, timber and spices. Compared to yachts, classical dhows are much lighter as they are built without a heavy keel. While this makes them unsteady, dhows are balanced by sandbags and the weight of the crew members. Modern-day dhows not only have sails and motors, but also high-tech engines and GPS systems. To enjoy this slice of the Emirati culture and the city’s enchanting history, take a dreamy dhow cruise in Dubai Creek as you sail under bridges and explore the old, more authentic side of this gorgeous nation against the drop of modern skyscrapers. 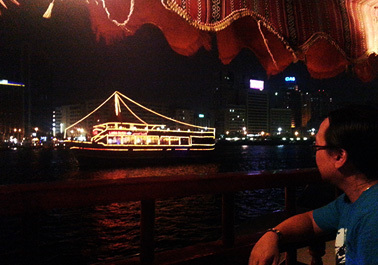 Dinner cruises from tour companies offer a fascinating glimpse of the radiance of Dubai at night at affordable prices. You can go in groups or book a corporate dinner or make it the best moment to propose your lady love. A two-hour dinner cruise usually starts at 8.30pm and ends at 10.30pm and includes a relishing all-inclusive sumptuous buffet dinner, soft drinks, tea and lots more. And if you are game for some thrilling moments, attend a real dhow race! At the last prime Al Gaffal Long Distance Race, honorary teams from France and Germany came to participate in Dubai. Yes, it’s indeed an intriguing event which drew a huge crowd from all over the world!